Here is a textbook specimen of a very rare Silurian brittlestar. 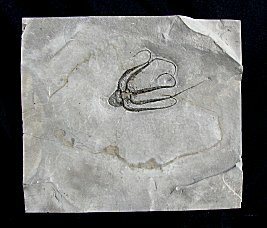 It is a large Protaster elongatus from the Rochester Shale of New York. This amazing fossil was acquired from the famous Chance Collection. Complete brittlestars are quite uncommon in the fossil record due to the delicate nature of the arms. Not only is this a rare fossil, it is also an extremely attractive specimen. ALL FIVE thin arms flow to one side to create this beautiful display. The detailed structure of this unusual echinoderm is clearly defined and quite distinct. The fossil has very good natural color and contrast and is well showcased on the rectangular plate of shale. This is simply a fabulous example of this ultra rare fossil brittlestar from the Silurian of New York - one of the most displayable examples of this type we have seen.